Infographic of the Day: What’s Your Social Currency? The National Science Foundation just announced the winners of its 2009 Science and Engineering Visualization Challenge, all of which appear in the latest issue of the journal Science, out today. There are a ton of great photos, illustrations, videos, and graphics among the bunch, including this beauty, an illustration of the forces lung cells exert in forming capillaries which will appear on the cover of the new Science. One of our favorites is Northwestern students Christian Thiemann and Daniel Grady’s “Follow the Money: Human Mobility and Effective Community,” winner of the Non-Interactive Media category. It’s a video (the above image is a still) based on data culled from Where’s George?, the collectively powered Web site where users enter their zip code and the serial number and series of any U.S. bill in order to chart the zany misadventures of American currency. The information it presents helps reveal the different ways money travels through the country and the true behavioral boundaries of American communities. Better understanding these patterns could shed light on a host of biological and anthropological phenomena, from the origins of dialects to the spread of disease. In fact, the two students were part of the Northwestern team The New York Times reported on last spring, which used Where’s George? 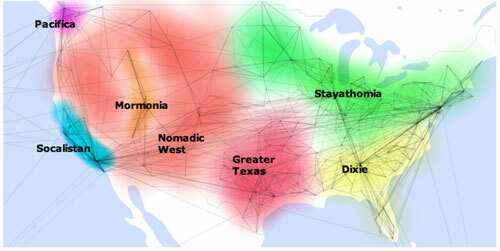 to track the potential spread of swine flu. 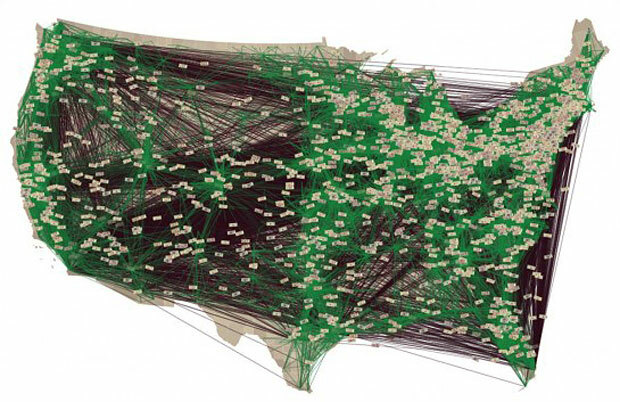 The image also calls to mind the visualization Pete Warden recently released based on data pulled from 210 million public Facebook photos, which reveals the connections among disparate parts of the U.S. The two maps are far from an exact match but they show similar patterns, offering a reminder that relationships are their own form of equity.